Today was a rest day in Staunton. I spent the morning walking the town which, to be truthful, didn’t take very long – this is a small town in Virginia. The town’s stand-out attraction is the American Shakespeare Centre with its theatre. This a reproduction of a theatre apparently used by Shakespeare’s company, the King’s Men, as their winter playhouse from 1608. The original theatre was indoors, in part of what had been the Blackfriars monastery – perhaps even in the early 1600s groundlings objected to getting wet in the winter? Anyway, a touring company of actors performing Shakespeare was established in the 1980s and in 2001 they moved to this newly built theatre and became a resident company. I had a tour around the theatre – supposedly a public tour I was the only taker which meant that it turned into more of a conversation than a presentation, which I liked. It was a good hour. The rest of the morning and lunchtime I spent just walking around and taking pictures, in one rather more picturesque area I found, the Wharf area. When the railroad came to Staunton (after the Civil War) there was an industrial boom in the town which lasted until some tine after the first World War, I think. This resulted in some industrial development around the station area, and this was known as the Wharf area. Today there’s just a single track with (very) occasional Amtrak trains stopping. Then in the afternoon I went for a drive up the Shenandoah valley and circled back over Massanutten mountain. It brought home how big the US is – this was a drive around a part of just one valley in the corner of one state, yet it was over 100 miles. 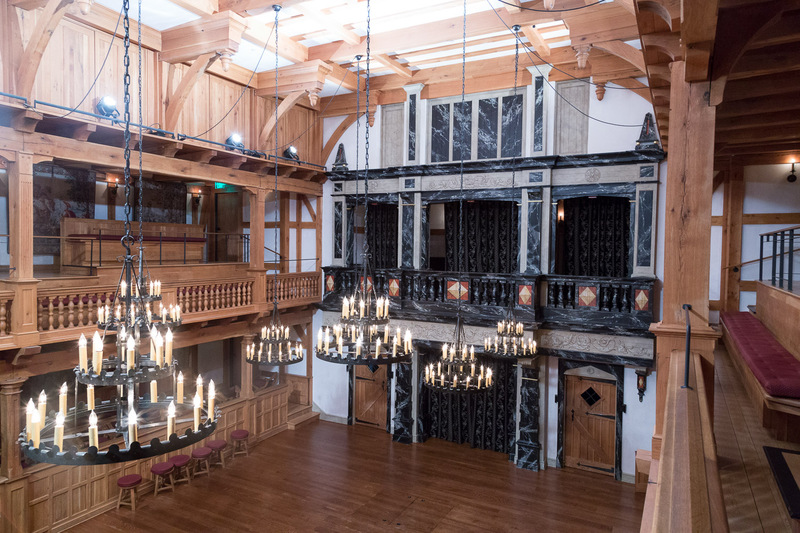 I’m not sure how I feel about reproduction Shakespearean theatres in the US…the Bard would be turning in his grave, I’m sure 🙂 Did you tell the guide about the Globe in London? And that I volunteer there? Yes I did tell them, and they were interested. They did say that Sam Wannamaker was familiar with their company when they were still just a touring company, and had encouraged their dream (at that time, whenever it was) of building their own theatre. And the lady who did the tour had visited the Globe.